Plumbing Tips for Homeowners: How does Home Plumbing Work? 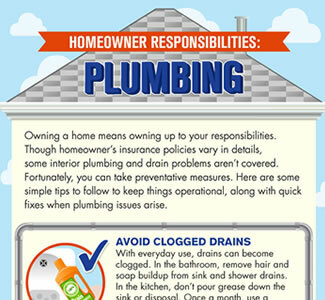 What are my Responsibilities for the Plumbing and Drainage as a Homeowner? When you sign on the dotted line for homeowner insurance, you might assume you're in the clear for any costly nightmares with drains, pipes, sinks, and other plumbing appliances. Not necessarily! Though policies vary in the details, most do not cover blocked toilets, sinks, showers, moving parts within a toilet tank, and other potential plumbing problems. The good news is that there are many steps that are preventive and proactive when it comes to the short-term and long-term health of your plumbing and drains. Keep drains clear. In the kitchen, that means not pouring food bits or anything greasy down your sink, including lettuce, raw vegetables, and meat bits. In the bathroom, be extra careful to remove hair and soap from sink and shower drains, as they are notorious for clogging pipes. Once a month, use a biodegradable drain treatment to eliminate any buildup of debris in sink and shower drains. Toilet tissue is the only thing you should flush down toilets. Not cotton swabs, sanitary products, diapers, paper hand towels, or anything else. If you have young children, make sure they don't throw toys in the toilet. Run hot water down all your drains regularly. Even if you're extra-careful, bits of grease can end up down your kitchen sink, and hot water will help dissolve it to avoid buildups. Same goes for your garbage disposal, especially the newer units, as they'll run more effectively if you run hot water into them for at least 15 seconds before every use. Have your home inspected annually by a licensed plumber. This professional should double-check all plastic fittings for the dishwasher, ice maker, laundry hoses, and more. A good inspection includes exercising all the stop valves and flushing the water heater from sediment. Check your washing machine hoses annually as well, looking for any bulges that might lead to problems. Always be on the lookout for signs of wear, bulging, or leakage in any lines or pipes. You don't want a plumbing emergency on your hands while water gathers at your feet! It can be extra-perilous if a leak occurs when you're away from home! Look for products that offer wireless sensing, as this technology sends an alert to your smartphone and instantly shuts off your water in the event you have a water leak. Learn more about how to protect your home from plumbing problems and yourself from sudden, unexpected home repair expenses with our plumbing protection plans, or call 1-888-733-1683. Direct Energy's Plumbing Essentials plans fill the gap left by your homeowners insurance. Get plumbing repair and maintenance coverage you can depend on. Get protected today!